At last, the perfect gift for your anti-Republican friends who believe that Fox News is an oxymoron: an elephant’s cage overfilled with snappy ringtone one-liners that are guaranteed to elicit more than a few chuckles. With the way things are going in the world today, anything that gets a laugh is one of the best things in life . . . and it’s tax free, which should actually please your Republican friends! Don’t worry – we’re also working now on our Ringtones for People Who HATE Democrats so we give equal time to all. 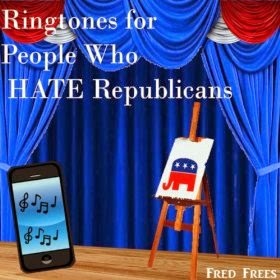 Fort Worth, TX – BearManor Media announces the release of Ringtones for People Who HATE Republicans, a collection of carps and quips voiced by The Man of 902 Voices, Fred Frees.